The Federal system has never provided an easy solution to resolve secessionist aspirations. However, even with the known federal paradox—on the one hand, a model to control external self-determination with its internal self-government; on the other, a state that can improve secessionist desires through antagonistic identities—, federalism is the best way to confront democratic legitimacies (contradictory plebiscites and their arithmetic rules without substantial values) with effective legality (rule of law under the original nation-state). The inevitable clash between the old juridical order (founded in the democratic “indissoluble” nation) and the radical aspiration for a new total sovereignty (vox populi, vox dei) could be counteracted through clear processes establishing checks and balances across different steps. 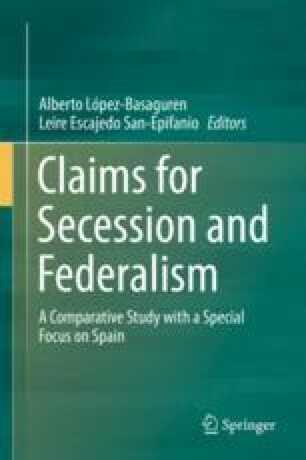 That is why the revision of Spanish Constitution would be the only way to provide a fair and lasting answer for different majorities between territorial communities and the whole population: to insert in the New Constitution a transactional clause of secession (also supported by a significant number of the sovereigntists)—with its qualified majorities, time delimitations, complex questions, and even external arbitrations—could be a better approach that would stabilize winners without imposing unilateral solutions. Nevertheless, to make this constitutional amendment we need to forget the ontological foundation of the Spanish Constitution (the unity and indivisibility of its Nation as unlimited power), including any notions of a nation as an existential community with homogeneous identity and monolithic decision. Without anachronistic ideas of absolute sovereignties (vox populi, always plural wills), the mutation from a univocal definition of nation-state to more political pluralities and multilevel governances could be the starting point to rebuild a true Federal Constitution which is open to intra-state solidarity. And here, the transnational integration under European and Universal orders—with their inviolable human rights and jus cogens—might help us find our real way.